Elizabeth hasn't been back to Loveless Texas in over 15 years. She didn't expect to inherit her grandmother's older home nor did she expect to walk in the door and find the contractor to be her old boyfriend J.D. Taking a tour of the home with still good looking J.D., Elizabeth finds she will need to stay longer than planned in order to sort through her grandmothers many possessions. In the meantime she catches up with old friends and realizes she misses the closeness of living in a small town. That small town living though means she runs into J.D. more times than she would like at first. She soon realizes that the spark is still there for both of them but doesn't understand why does J.D. want to keep his distance. 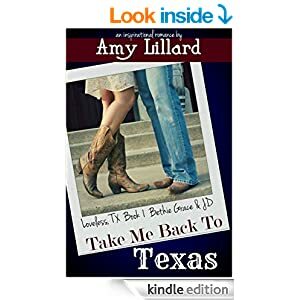 A good clean romance story about going back and finding the life and love that was meant for her. I love the small town visions of friends and activities described in this book, I also love the inspirational side when Elizabeth finds in the rush of city living she has drifted away from God. A great story and one I loved reading. This book was given to me by the author in exchange for a honest review.